Hello Girls! There is currently a thick blanket of snow covering London which makes me super excited. 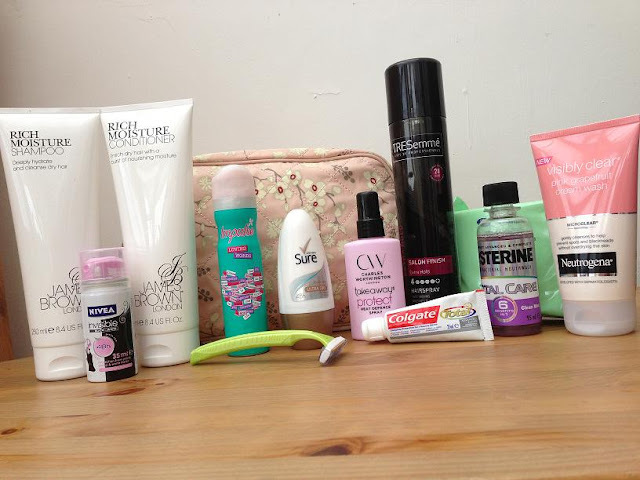 For my last post for the next week I thought I'd show you what things I'm taking with me in my wash bag as I'll be staying at my boyfriends. As part of my Media course I have to undertake a week of work experience for a Media company, and I've been lucky enough to have mine at a magazine. It may not be Vogue, but it's always good to start somewhere and I'll be working at a magazine called Live, which is aimed at people aged 16 to 24. I can't wait either! It's in Brixton which is great as I'm able to stay at my boyfriends for the week as he only lives in Streatham, so I won't be blogging for the next week or so. Sobs. But I have some great new posts coming up when I get home as the offices where the magazine is based are right next to a department store and a Superdrug. This shouldn't be allowed; lunch breaks will never be the same again! Anyway, after my slightly rambling intro, I'll get started with my last post for the week. I took advantage of the 2 for £8 offer in Boots on James Brown haircare as I've used the brand in the past and really liked it. I went to the travel section and found the cutest mini deodrant, deat defence spray, toothpaste and mouthwash - how cute are they?! The razor is pretty self explanatory and you can't go wrong with Impulse body spray in your bag either (also on offer for 99p!). I'm anxious to try the Neutrogena cream face wash as I didn't get on with the gel wash too great but I'm keeping my fingers crossed as I'm stuck with it for a week!